Equine Arthritis and Bone Degeneration. Is Reversible Possible? Equine arthritis and bone degenerative changes are all too common in the horse industry. These changes can impact any joint, but commonly found in the fetlock, carpus or knee, hock or tarsus, stifle, hip and back region. 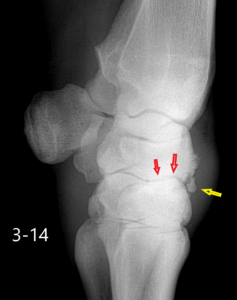 The navicular bone and coffin bone are also commonly impacted and associated with navicular disease and pedal osteitis. These bone and joint changes are common in the horse, especially the equine athlete, limiting motion, and creating pain. More often than not, when the joint degenerates and arthritis forms, it is a career-ending event for the horse. Our normal efforts with medications and joint injections can be helpful in the short-term, but in the long-term the horse is often worse than in the beginning. Can you do better? Is arthritis in the horse potentially reversible? As a veterinarian, a high percentage of the horses that I worked on daily exhibited some form of arthritis, which impacted them on various levels. For some, the condition was early stage, manifesting as a joint effusion or swollen joint, but no signs of bone deterioration on x-ray. While for others, the joint problems were persistent for years and on x-ray, there was notable joint deterioration and joint remodeling. Despite being a doctor, the only therapeutic options that I had to offer were non-steroidal pain medications (NSAIDs) or joint injections with corticosteroids. Interestingly, these are the same therapies utilized today, some 20 years later. They have incorporated some other treatment options, including hyaluronic acid or PGAGs, but overall, the response is still about the same. Unfortunately, most of these horses live a life of discomfort, receiving symptomatic injections or medications to abate the pain during their lives of competition. Once the condition progresses further, the horses are often retired and many receive only a fraction of the level of care that they once did when competing. For many others, their owners provide the highest level of support they can physically or financially afford, which is all that one can ask. Considering that arthritis and bone deterioration is inevitable for most horses on some level, it really becomes a matter of questioning whether if you can intervene to prevent, slow the process, or possibly even reverse it on some level? Seeing as how our current methodologies have not provided much results, other than symptomatic relief, we have to ask if it is possible to do better? Can you truly prevent and maybe even reverse this condition in the horse?? We are told it is impossible…but is it? 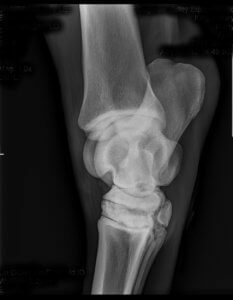 Equine Arthritis, Bone Deterioration. Why it Happens. All horses are destined to develop arthritis and bone deterioration on some level, especially as they age. The process of arthritis and bone deterioration is a direct result of chemical signaling within the body, closely linked with the inflammatory process. This process comes to a head as the horse’s body ages, with more free radical and oxidative damage occurring. The equine athlete is predisposed to a higher incidence, often at a much younger age, due to the negative impact that the training, competition and high levels of stress have upon the bone structure, joints, and overall health. 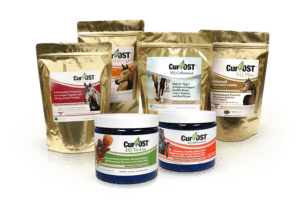 Joint and bone damage is further accelerated by other factors such as poor hoof balance, conformation, and even the diet. The degenerative changes in the joints and bones are a direct result of cellular signaling and the inflammatory process. Pro-inflammatory enzymes and proteins including interleukins, prostaglandins, and matrix-metalloproteinases are released and create change within those structures. Bone cells termed osteoclasts and osteoblasts often become unbalanced and unregulated. This can result in increased bone density if osteoblasts are more active, or bone loss when osteoclasts are dominant. In a normal state of health, the two bone cell types are balanced, leading to healthy bone formation with adequate density and strength. Current therapy options such as NSAIDs mainly target pain pathways and prostaglandin formation. Others, including corticosteroids do impact other pathways, but their dosage is critical to their effect and a higher dosage can result in significant side effects for the horse. Hyaluronic acid and PGAG therapy aim to ‘rebuild’ the joint either by improving joint fluid or cartilage health, but their effect is often limited due to ongoing inflammation in the horse. Research indicates that it is possible to mitigate or alter this inflammatory pathway, not just through medications or pharmaceuticals, but also through herbs and foods. Honestly, herbs and food offer better clinical results often when compared to medications, mainly due to their non-limited impact on inflammation and also lack of side effects. If it is possible to impact the inflammatory process, is it possible to reverse the damage that has been done to the joint or bone in the horse? Especially considering how closely this process is connected with the actual bone degeneration? In our research and rehabilitation center, most of the horses that we encounter have arthritis, joint damage, and bone changes on some level. They are retired equine athletes from various disciplines with most being deemed unsalvageable by their owners, having exhausted all existing therapies. In our program, our goal is to investigate options for therapy beyond those traditionally accepted. The horses that are presented in the program are often severe cases, and they are ideal for investigation as any improvement can dramatically impact their well-being. All repeated radiographs were taken at identical radiograph settings to maintain consistency. 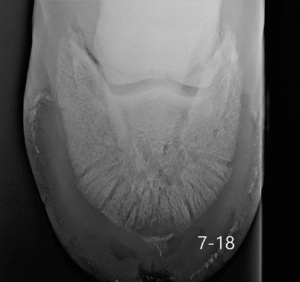 Case Number One: A 7 y.o Off-Track TB Gelding with chronic right front lameness and pedal osteitis, which was unresponsive to any therapy and require constant shoes to keep comfortable at a walk. Clinical soundness was quickly gained without shoes and on a hard surface. 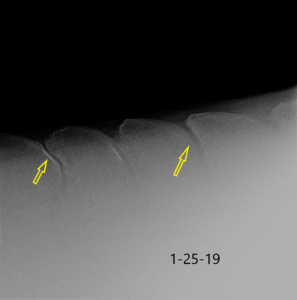 Over a 5 month period of time, bone changes and improvement in bone health were evident on radiograph with increased bone density in the second film and a smoother peripheral bone margin to the coffin bone. This would imply that an improved balance was achieved not just in the inflammatory process but between osteoclasts and osteoblasts, with more new bone formation and improved density. Case Two: 11 y.o TB gelding with clinical kissing spine lesions in the lumbar vertebrae resulting in retirement from active work and non-responsive to traditional medications and injections. The image on the left was taken in October 2018 and the right was taken January 2019. The gelding was placed on the same regimen as the above mentioned horse, including barefoot trims and balance, supplements, a clean diet and routine exercise regimens three times weekly. Over the 4 month period, this gelding has regained strength and topline. Overall back stiffness was and continues to be markedly improved. On review of the x-rays, there is a slight improvement in the joint spacing between the dorsal vertebral processes, as noted by the yellow arrows. This space is ‘cleaner’ on the most current film. This is very interesting to note as in most cases of progressive kissing spine cases, over a 4 month period, there is more degeneration noted, not improvement. I would have expected continued joint space narrowing and bone remodeling, as compared to a clearer environment. Case Three: A 7 y.o. Off-Track TB gelding that was retired due to a right front carpal slab fracture. This horse was stall rested for approximately 6 months with no surgical or rehabilitation efforts. 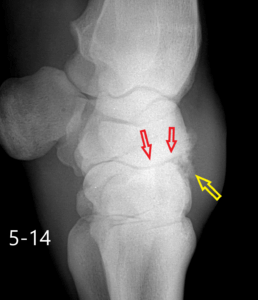 The carpus, due to bone fracture remodeling and mal-union, was restricted in range of motion and the horse was a grade 5/5 lame on most occasions. The overall prognosis was extremely poor for a return to a functional life on pasture. This gelding was placed on a clean diet as described above along with alfalfa hay. He was allowed at pasture to a restricted space of approximately one acre for 10 hours per day with no forced work. His shoes were removed and he was put on a trim regimen of every 2 weeks to maintain balance and proper landing. The supplement regimen was the same as that mentioned above for the other two cases. Over the two month period of time, the gelding regained about 60% range of motion in the carpus upon flexion and his soundness improved to the point where he could run with the herd, self-modifying his gait to accommodate. 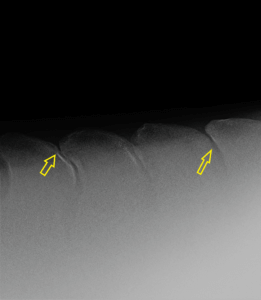 Upon review of the radiographs, the original osteophyte and evident bone remodeling off of the dorsal aspect of the proximal row of carpal bones reduced in density dramatically with evident new bone resorption (yellow arrow). 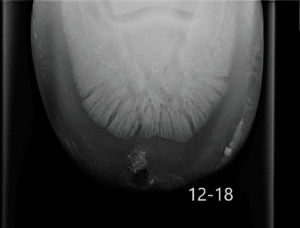 There is evident remodeling to the dorsal aspect of the proximal carpus, as to be expected, but the overall density of this new bone is markedly reduced. The intercarpal joint also appears to have regained lucency with evident new bone resorption and overall appears ‘cleaner’ than the original film. Can Equine Arthritis Be Improved or Reversed? Arthritis in the horse is an inevitable fact of life for many, especially as they age. Considering that our current treatment modalities offer only symptomatic relief and rarely impact the process of arthritis itself for the horse, newer options are desired. The fact is that there is a tremendous data base of information on specific herbs that have been demonstrated to impact the expression and balance of osteoclasts and osteoblasts in animal models or in-vitro studies. Sadly, this information is rarely explored to its fullest extent. In most cases, herbs are used at reduced doses to impact symptoms which does help the horse clinically, but the ultimate question is what is possible if the doses are increased and continued for extended periods of time. Of course, this is not used as a solo-therapy, but other factors contributing to the clinical problem are addressed additionally. This includes proper foot care, dietary changes, and stress modification. There is a synergistic effect between herb usage, diet modification, and other lifestyle factors. The ultimate question in my mind as a veterinarian and researcher is what exactly is the potential for the herbs alongside of other contributor modification? These three cases are just a small representation of what we have noted in our facility over the past 5 years. Given these positive changes, it raises the question if more can be accomplished? Considering the slow bone turnover rate, more than likely it is possible to witness even more positive changes with more time. However, for many owners and veterinarians, time is of essence as we often desire results rather quickly. This is where and why we turn to quick symptomatic relief with medications and injections. Ironically, it is possible to achieve both symptomatic relief and possible long-term bone changes with the same effort, if that effort is applied correctly and consistently. What do I believe, as a veterinarian? I believe that change and regeneration is possible in all tissues, including the bone. After all, that is our goal with ‘regenerative’ medicine, to not only provide relief for the patient but to ‘regenerate’ tissue. This may be what we are seeing in these three isolated cases. If slow bone reversal and restoration is what is noted in these three select cases, one then has to ask what if we applied this approach from a preventative standpoint? Imagine what IS possible! Have questions regarding your horse? Check out our consultations! I am very interested in your supplements. I would like to show copies of the clinical trials ando my vet. Where are those available? Hello. Thank you for your interest. I do not have any clinical published data, but more so these findings are based on clinical experience in rehabilitation equine patients. The cases noted in this article are just a small sample of what we have observed. Thank you.